Meet dogs who think, problem-solve, and teach humans a thing or two! The Garden Is Going to the Dogs! Cali, under the blossoming cherry trees, with her tennis ball. 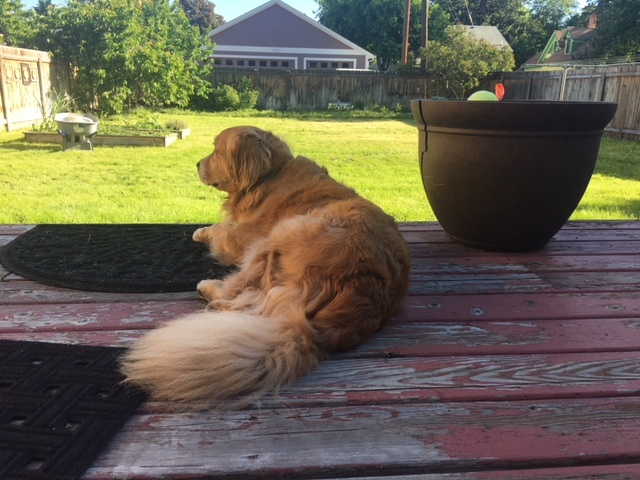 It’s February in Montana, so reading an article about planning a “sensory garden” for dogs was a nice escape from the cold. Since Cali has staked her claim to the back yard of our house, though, and much landscaping is needed, it’s also great inspiration. The first piece of advice is to watch how the dog uses the space — where she hangs out, where and what she sniffs. That’s easy. 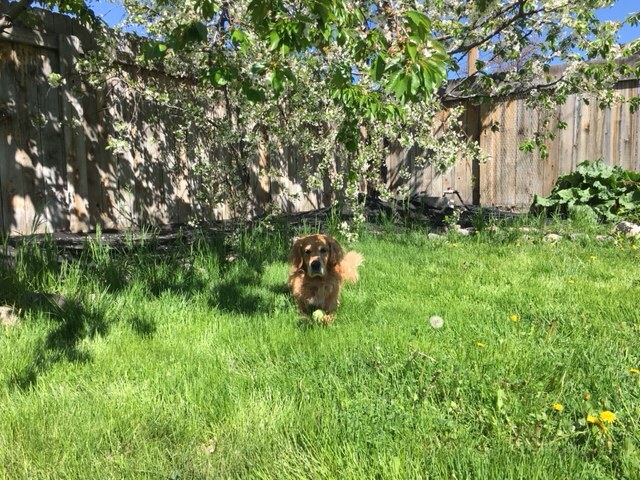 Cali’s favorite spot is under the cherry trees and next to the raspberries. In the summer, her favorite spot is in the raspberries, harvesting and eating as many berries as she can reach. But even in the winter, she’s most likely to be found in that corner of the garden. Then, plan ways to enrich the garden for her enjoyment and mental stimulation. This means stimulating all of her senses. Foremost for dogs is, of course, smell. Plant things that she enjoys sniffing. Ideally, plant several plants and flowers that will bloom and grow at different times of the year. Here in Montana, that’s a fairly small part of the year, so other senses will have to dominate in the winter. For visual stimulation, the author of the article suggests rocks, logs, items of different heights to create variation. To stimulate hearing, she suggests running water, wind chimes, or rustling plants. Those wouldn’t really work too well in a Montana winter either, but in our somewhat urban neighborhood, there is plenty of aural stimulation. Taste is a tough one. I have always discouraged my dogs from sampling the garden plants. Timo, my first dog, loved lemon verbena and once ate every single leaf from a small plant. The plant did not survive the assault, but Timo and the larger one coexisted happily for many years. As a puppy, Jana enjoyed harvesting strawberries and blackberries in our garden. Cali enjoys the cherries and raspberries in season, of course. But the suggestions of verbena, thyme, and other safe and appealing plants are worth considering. Finally, tactile stimulation is essential. Cali loves to dig; I have thought about creating a digging spot for her in the garden. Another suggestion is using a variety of textures — grass, mulch (check and check) and paths made of stones or crushed granite, or even sand. We can definitely work more of that into our landscaping. A final suggestion is creating opportunities for the dog to run around. When Cali has friends over, they do create a sort of circuit, looping into the cherry-tree corner and under the clotheslines. Know which plants are toxic to dogs and avoid these. Use raised beds, pots, or plant borders to steer dogs away from no-go zones, like the vegetable patch. Interestingly, though Cali dug up all our baby tomato plants the day we planted them, she never bothered the vegetable gardens after that, even though she loves cucumbers, and the cukes were well within her reach. She quickly learned that the raised beds were my turf. Consider your dog’s age and activity level. For some dogs, simple agility equipment or things they can climb or jump onto are a good addition. The garden can be very appealing to humans, too. But too many yards are designed only for the people in the family. Since Cali spends exponentially more time in our yard than I do, it’s only fair to create a place she will enjoy fully! Like “Thinking Dog Blog” on Facebook! Can my dog be vegan? A Dog’s Purpose: Was the Dog Abused? Are Doggy DNA Tests Worthwhile? Are dryer sheets dangerous to dogs? Can dogs be allergic to cats? Do dogs get hiccups? How can you get rid of them? How can I be sure that my pet’s food is safe? How can I get my dog to stop rolling in smelly stuff? How do I get all that fur off of my sofa? How do I provide mental stimulation for my dog? How does getting a second dog change your relationship with your first dog? My dog has really bad gas. What can I do? What are the BEST dog toys? What is your opinion of an E-collar? What should I do when my dog gets spooked? Why Is My Dog’s Eye Red?